Vegemite (/ˈvɛdʒɪmaɪt/ VEJ-i-myte) is a thick, black Australian food spread made from leftover brewers' yeast extract with various vegetable and spice additives. It was developed by Cyril Percy Callister in Melbourne, Victoria in 1922. The Vegemite brand was owned by Mondelez International (formerly Kraft Foods Inc.) until January 2017, when it was acquired by the Australian Bega Cheese group in a US$460,000,000 (equivalent to about $470,000,000 in 2018) agreement for full Australian ownership after Bega would buy most of Mondelez International's Australia and New Zealand grocery and cheese business. A spread for sandwiches, toast, crumpets and cracker biscuits as well as a filling for pastries, Vegemite is similar to British Marmite, New Zealand Marmite, Australian Promite, MightyMite, AussieMite, OzEmite, German Vitam-R, and Swiss Cenovis. Vegemite is salty, slightly bitter, malty, and rich in glutamates – giving it an umami flavour similar to beef bouillon. It is vegan, kosher, and halal. In 1919, following the disruption of British Marmite imports after World War I and prior to the introduction of Vegemite, Callister's employer, the Australian company Fred Walker & Co., gave him the task of developing a spread from the used yeast being dumped by breweries. Callister had been hired by the chairman Fred Walker. Vegemite was registered as a trademark in Australia that same year. Callister used autolysis to break down the yeast cells from waste obtained from the Carlton & United brewery. Concentrating the clear liquid extract and blending with salt, celery and onion extracts formed a sticky black paste. Fred Walker's company first created and sold Vegemite in 1922. Following a competition to find a name for the new spread, the name "Vegemite" was selected by Fred Walker's daughter, Sheilah. Vegemite first appeared on the market in 1923 with advertising emphasising the value of Vegemite to children's health but failed to sell very well. Faced with growing competition from Marmite, from 1928 to 1935 the product was renamed as "Parwill" to make use of the advertising slogan "Marmite but Parwill", a convoluted pun on the new name and that of its competitor; "If Ma [mother] might... then Pa [father] will." This attempt to expand market share was unsuccessful and the name was changed back to Vegemite, but did not recover lost market share. In 1925, Walker had established the Kraft Walker Cheese Co. as a joint venture company with J.L. Kraft & Bros to market processed cheese and, following the failure of Parwill, in 1935 he used the success of Kraft Walker Cheese to promote Vegemite. In a two-year campaign to promote sales, Vegemite was given away free with Kraft Walker cheese products (with a coupon redemption) and this was followed by poetry competitions with imported American Pontiac cars being offered as prizes. Sales responded and in 1939 Vegemite was officially endorsed by the British Medical Association as a rich source of B vitamins. Rationed in Australia during World War II, Vegemite was included in Australian Army rations and by the late 1940s was used in nine out of ten Australian homes. In April 1984, a 115-gram (4.1 oz) jar of vegemite became the first product in Australia to be electronically scanned at a checkout. Vegemite is produced in Australia at Bega Cheese's (formerly Mondelez's) Port Melbourne manufacturing facility, which produces more than 22 million jars per year. Virtually unchanged from Callister's original recipe, Vegemite now far outsells Marmite and other similar spreads in Australia. The billionth jar of Vegemite was produced in October 2008. Vegemite was also produced in New Zealand for over 50 years, but as of August 2006 New Zealand production had ceased. A common way of eating Vegemite is on toasted bread with a layer of butter or margarine. Only a small amount of Vegemite is required due to its strong flavour. A Vegemite sandwich may consist of two slices of buttered bread, Vegemite, and cheese, but other ingredients such as lettuce, avocado and tomato can be added as well. Vegemite can be used as a filling for pastries, such as the cheesymite scroll, or it may even be used in more exotic dishes. The official Vegemite website contains several recipes using Vegemite in foods such as pasta, burgers, pizzas, casseroles and ice cream. Limited quantities of kosher Vegemite were first produced in the 1980s; a 2004 decision to cease certification was reversed after a backlash from Jewish consumers. Around 2009, Kraft contracted with the Kashrut Authority in New South Wales for their kashrut supervision services, and by 2010, all jars and tubes of ordinary Vegemite were labelled with the authority's stamp. In 2010, Vegemite also received halal certification. Vegemite is one of the richest sources of B vitamins, specifically thiamine, riboflavin, niacin and folate (B1, B2, B3 & B9, respectively). Unlike Marmite and some other yeast extracts, the base version contains no vitamin B12 although both B6 and vitamin B12 are added to the low-salt formulation. The main ingredient of Vegemite is yeast extract, which contains a high concentration of glutamic acid, the source of Vegemite's rich umami flavour. Vegemite does not contain any fat, added sugar or animal content. It contains gluten (a composite of storage proteins). Vegemite contains 3.45% sodium, which equates to a salt content of approximately 8.6%. Australia only defines low salt foods, but by UK standards Vegemite is classified as a high salt content food. The low-salt version of Vegemite with a distinctive pale orange lid was introduced to the Australian domestic market in September 2014, offering a 25% reduction in sodium content. The low-salt version is also fortified with vitamins B6 and vitamin B12. Vegemite fights with the men up north! If you are one of those who don't need Vegemite medicinally, then thousands of invalids are asking you to deny yourself of it for the time being. At the same time, "Sister MacDonald" insisted that Vegemite was essential for "infant welfare" in magazines. Later advertisements began to promote the importance of the B complex vitamins to health. Vegemite's rise to popularity was helped by the marketing campaigns written by J. Walter Thompson advertising that began in 1954, using groups of smiling, healthy children singing a catchy jingle titled "We're happy little Vegemites". First aired on radio in 1954, the jingle was transferred to television in 1956. This advertising campaign continued until the late 1960s but, as it was targeted to children, it was discontinued in favour of ads promoting the product to all ages. In the late 1980s the original black and white television commercial was remastered, partially colourised and reintroduced. This commercial was to be broadcast periodically from 1991 to 2010. The two young twin girls who sang this advertising jingle were known as the "Vegemite Twins". In March 2007, Kraft announced that they were trying to trace the eight original children from the campaign to celebrate the advertisement's fiftieth anniversary and to take part in a new campaign. The 1956 commercial was to be remade with the original children, now grown, to forge a link between "the new generation and the old ad". The media took up the search on Kraft's behalf with all eight children identified in eight days and resulted in many TV specials and interviews in the Australian national media. The 50-year reunion campaign won the Arts, Entertainment & Media Campaign of the Year award at the November 2007 Asia Pacific PR Awards. Originally introduced in 57 g (2 oz) milk glass jars and in sizes up to a 2.7 kg (6 lb) tin, from 1956 Vegemite was sold in clear glass jars. During the 1990s, Kraft released a product in Australia known as Vegemite Singles. It combined two of Kraft's major products, Kraft Singles and Vegemite, into one, thus creating Vegemite-flavoured cheese. This extension of the Vegemite product line was an attempt by Kraft to capitalise on the enormous popularity of Vegemite and cheese sandwiches (made by placing a slice of cheese into a Vegemite sandwich). Vegemite Singles were later taken off the market. On 13 June 2009, Kraft released a new version of Vegemite. The formula combines Vegemite and Kraft cream cheese, spreads more easily and has a considerably less salty and milder taste than the original. To coincide with the release of the new recipe, Kraft ran a competition to give the new flavour a name. The new name was announced during the broadcast of the 2009 AFL Grand Final as iSnack 2.0. The name was chosen by a panel of marketing and communication experts to appeal to a younger market, capitalising on the popularity of Apple's iPod and iPhone. The choice immediately drew universal criticism and ridicule within Australia. Within days, opinion columns and social networking sites were flooded with derision and vitriol, and after only four days, Kraft released plans to abandon the iSnack name, admitting that it may have been a mistake. Two days later, Kraft opened a new poll on its website, and the final name was announced on 7 October 2009 as "Vegemite Cheesybite", with Kraft claiming that the name had received 36% of the 30,357 votes that were cast for a name option, or approximately 10,900 votes. It was noted that the popular suggestion "Cheesymite", long associated with the popular Cheesymite scroll, was already trademarked by other organisations. In 2011, Kraft Foods Australia launched "My First Vegemite", a special formulation of original Vegemite for children aged older than one year. According to Kraft, the new formula has a "milder taste" and "additional health benefits including iron, B6 and B12 vitamins as well as 50% less sodium", and was designed in response to consumer demand for foods with lower sugar and salt content plus additional health benefits. Immediate reaction and media reports regarding the new formula were largely positive, but Kraft Foods Australia discontinued the "My First Vegemite" product line in 2012 due to poor sales performance. In April 2015, Cadbury announced that it was to release a Vegemite-flavoured block of chocolate on 1 June. The chocolate block is Cadbury's Caramello block updated by mixing vegemite with the chocolate. Critics described the taste as similar to salted caramel with a pleasant umami aftertaste. Criticism varied from "love it" to tasting like a "caramel and turkish delight filling with a lot of salt" to "needs more salt" with several tasters commenting that they thought the aftertaste was unpleasant. In 2017, a premium variety, Vegemite Blend 17, was released for a limited time. It promised a "richer bolder taste" but at double the price of the standard product. Other commercial products with Vegemite flavour include Smith's Crisps, In a Biskit, bagel crisps, sausages and meat pies. In October 2006, an Australian news company reported that Vegemite had been banned in the United States, and that the United States Customs Service had gone so far as to search Australians entering the country for Vegemite because it naturally contains folate, a B vitamin approved as an additive in the United States for just a few foods, including breakfast cereals. The story appears to have originated as an anecdote by a traveller who claimed to have been searched by U.S. Customs and a spokesperson for Kraft made a misinformed comment to reporters. The U.S. Food and Drug Administration later stated that there were no plans to subject Vegemite to an import ban, or withdraw it from supermarket shelves. The United States Customs and Border Protection tried to dispel the rumour, stating on its website that "there is no known prohibition on the importation of Vegemite" and "there is no official policy within CBP targeting Vegemite for interception". The story of the "ban" later took on the status of urban legend. While Vegemite has never been popular in the US, it can still be purchased at supermarkets that stock imported food items. Following newspaper reports in May 2011 that Vegemite and Marmite had been banned and were being removed from shelves in Denmark, outraged fans set up several Facebook groups. In response, Denmark's Ministry of Food, Agriculture and Fisheries stated that neither spread had been banned but that the respective companies had not applied for licences to market their products in Denmark. In 2004 Denmark had passed legislation prohibiting the sale of food products fortified with vitamins as a danger to health. Vegemite is banned from Victorian prisons, with the bans beginning to come into effect from the 1990s, to prevent inmates from brewing alcohol using the paste's high yeast content, despite the fact that Vegemite contains no live yeast. Similar bans were proposed in 2015 for a number of dry communities in outback Australia, but were not enacted. The Australian rock band Men at Work refer to a "Vegemite sandwich" in the second verse of their 1981 hit song "Down Under", from their debut album Business as Usual. 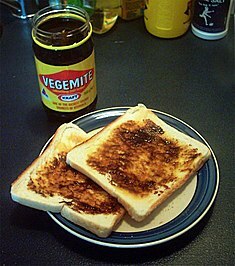 Vegemite was mentioned in the original version of John Williamson's song "True Blue". He removed the reference in a later version of the song because Vegemite was not Australian-owned. According to Williamson's web site, it was "carelessly sold off ('like sponge cake') to the multi-national Kraft". Two song titles from Amanda Palmer's 2011 album Amanda Palmer Goes Down Under reference the product: "We're Happy Little Vegemites" and "Vegemite (The Black Death)". Australian rock band King Gizzard & the Lizard Wizard have a song named "Vegemite" in their album Oddments. Mem Fox in 1983 wrote the children's book Possum Magic. The story involves an invisible possum who needs to eat Australian foods in order to become visible again. Among these foods is a Vegemite sandwich. U.S. President Barack Obama, in response to a question in March 2011 during a joint visit with Australian Prime Minister Julia Gillard to a high school in Virginia, gave his impression of Vegemite by stating "It's horrible". Following a description by Gillard, he said: "So, it's like a quasi-vegetable by-product paste that you smear on your toast for breakfast – sounds good, doesn't it?" During a rain delay in the 2012 Quicken Loans 400 at Michigan International Speedway, Australian race car driver and pole sitter Marcos Ambrose gave Vegemite sandwiches to the NASCAR on TNT commentary team. After taking his first bite, Kyle Petty commented: "He may be the fastest man on the racetrack. I may be the fastest man on TV headed for the bathroom." Larry McReynolds followed it up by saying: "Oh, my God. Are you sure this is edible? God! I need Sani-Flush or somethin'." In a 2013 episode of his show, Steve Harvey was offered a jar of Vegemite by an Australian audience member. After tasting a small amount of it, he stated: "Vegemite sounds like a pesticide. That's about damn near what it tastes like." Hugh Jackman demonstrated how to correctly spread Vegemite on the U.S. talk show The Tonight Show Starring Jimmy Fallon. Terry Pratchett's Discworld book The Last Continent features Rincewind the wizard accidentally inventing a substance very similar to Vegemite, which proves to be very popular with the citizens of XXXX (the Discworld equivalent of Australia). ^ vegemite. Dictionary.com Unabridged (v 1.1). Random House. 4 May 2009. ^ a b c d "The Vegemite Story". Kraft Foods. ^ a b "Vegemite bought by Bega from US food giant Mondelez International – ABC Rural – ABC News (Australian Broadcasting Corporation)". ABC News. 19 January 2017. Retrieved 19 January 2017. ^ "FAQs - Start with VEGEMITE". vegemite.com.au. Retrieved 21 November 2018. ^ Farrer, K.T.H. "Walker, Fred (1884–1935)" (Web Bio). Australian Dictionary of Biography. Retrieved 8 February 2008. ^ "Australian food – breaking the rules of fine dining". Convict Creations.Com. Retrieved 10 May 2009. ^ "Fred Walker, Founder". Kraft Foods. 2010. Archived from the original on 20 September 2013. Retrieved 23 April 2013. ^ a b Sheedy, Chris; Jenny Bond (2006). 100 Great Icons. Milsons Point, New South Wales: Random House Australia. pp. 34–35. ISBN 978-1-74166-501-7. Retrieved 12 November 2011. ^ "History of Vegemite – 1922". eurekacouncil.com.au. Eureka Council. Archived from the original on 23 July 2008. Retrieved 30 April 2018. ^ Tan, Winston (5 October 2008). "Vegemite produces billionth jar". AAP. ^ John Wilson (4 March 2009). "New Zealanders take to Vegemite". Te Ara: The Encyclopedia of New Zealand. New Zealand Government. Retrieved 26 April 2011. ^ "'Marmageddon': There's always Vegemite, says PM". The New Zealand Herald. 20 March 2012. Retrieved 19 February 2014. Mr Key told Firstline this morning that he also likes the Australian-made rival Vegemite. ^ "Vegemite FAQs". Archived from the original on 26 January 2014. Retrieved 19 February 2014. ^ "Marmite FAQs". Archived from the original on 29 August 2006. Retrieved 31 January 2015. Are Marmite and Vegemite both made in NZ? They used to be – Vegemite recently pulled out of NZ and have gone back home to Australia where they belong. Marmite was not only the first, but is also the ONLY yeast spread made in New Zealand. ^ Marmite Fact or Fiction, archived from the original on 29 August 2006, retrieved 31 January 2015, ...Vegemite first came to us from Australia and they even made it here for a while. But as you can see from their packaging, they have buzzed back home to Australia. ^ "Vegemite". about-australia-shop.com. Retrieved 30 April 2018. ^ "Lunch recipes". Mondelez Australia. Archived from the original on 21 January 2014. Retrieved 21 January 2014. ^ "Snacking recipes". Mondelez Australia. Archived from the original on 25 January 2014. Retrieved 21 January 2014. ^ "Dinner recipes". Mondelez Australia. Archived from the original on 25 January 2014. Retrieved 21 January 2014. ^ "VEGEMITE Icy Poles - Start with VEGEMITE". Start with VEGEMITE. 1 May 2017. Retrieved 21 January 2018. ^ zsero (28 January 2010). "Re: Vegemite [Sandwich]". Chowhound » Kosher. Retrieved 9 August 2013. Back in the '80s Kraft started distinguishing the first batch of vegemite made on the newly-kosher equipment, by putting a K next to the use-by date. ^ a b Hargreaves, Wendy (24 January 2010). "Vege spite spreads". Sunday Herald Sun. Retrieved 8 August 2013. ^ "Kosher Product Directory » Spreads". Sydney, Australia: Kashrut Authority. Retrieved 6 August 2013. Vegemite: all sizes. Updated: Tue 11 Aug 2009. The procedure for obtaining Kashrut Authority certification is detailed in: "KA Certification Guidelines". Sydney, Australia: Kashrut Authority. Retrieved 9 August 2013. ^ a b "Reduced Salt Vegemite". FAQs. Kraft foods. Archived from the original on 13 March 2016. Retrieved 23 March 2016. ^ White, Robert (1994). "A Brief Cultural History of Vegemite". In Craven, Ian; Gray, Martin; Stoneham, Geraldine (eds.). Australian Popular Culture. Cambridge, United Kingdom: Cambridge University Press. pp. 19–20. ISBN 0-521-46667-9. Retrieved 12 November 2011. ^ "Vegemite". Kraft Foods. Retrieved 31 January 2012. ^ "How to convert sodium to salt (and salt to sodium)". foodwatch.com.au. Retrieved 31 January 2012. ^ "How do I know when shopping which are low and high salted foods?". FAQs. Australian Division of World Action on Salt & Health. Retrieved 31 January 2012. ^ "Vegemite – Food Nutritional Information Panel". Retrieved 28 August 2012. ^ "History of Vegemite – 1922". The Eureka Council. Archived from the original on 23 July 2008. Retrieved 23 September 2010. ^ Happy Little Vegemites. australianscreen. ^ Canning, Simon (15 March 2007). "Modern tots replace the veteran happy Vegemites". Features. The Australian. p. 13. Archived from the original on 21 March 2007. Retrieved 17 October 2010. ^ McNaught, Megan (15 June 2009). "Quite a crafty spread Vegemite and cheese join forces in the jar". Herald-Sun. p. 13. Archived from the original on 17 June 2009. Retrieved 5 September 2009. ^ Pepper, Chris (27 September 2009). "So, how bad were the other Vegemite names?". The Advertiser. p. 7. ^ "New Vegemite spread named iSnack2.0". heraldsun.com.au. 27 September 2009. Retrieved 28 September 2009. ^ (30 September 2009). "Vegemite abandons iSnack2.0 name" Archived 13 May 2012 at the Wayback Machine. The West Australian. West Australian Newspapers. ^ Prior, Flip (30 September 2009). "iSnack 2.0 crashes". The West Australian. Archived from the original on 13 May 2012. Retrieved 30 September 2009. ^ "Vegemite Name Me". Kraft. Archived from the original on 7 October 2009. Retrieved 7 October 2009. ^ "Mumbrella". Retrieved 8 October 2009. ^ Delaney, Brigid (18 May 2015). "Vegemite chocolate taste test: is Cadbury's new block awesome or evil?". The Guardian. Retrieved 23 May 2015. ^ "Cadbury has released that Vegemite chocolate block – and we tried it". Sydneyland. Retrieved 23 May 2015. ^ Brown, Vanessa (11 October 2017). "New Vegemite will retail for double the amount of the original spread". news.com.au. Retrieved 30 April 2018. ^ "VEGEMITE". www.facebook.com. Retrieved 30 April 2018. ^ "CalorieKing.com.au - Food Data. Nutrition information about your favourite food. fat, fibre, protein and more - New Food Updates". www.calorieking.com.au. Retrieved 30 April 2018. ^ "ABE's Bagel Bakery partners with Vegemite - Australian Food News". www.ausfoodnews.com.au. Retrieved 30 April 2018. ^ "Please, leave Vegemite alone". news.com.au. Retrieved 30 April 2018. ^ "Four'N Twenty Just Launched A Vegemite Pie". lifehacker.com.au. 17 July 2017. Retrieved 30 April 2018. ^ "Authorities probe Vegemite ban reports". The Sydney Morning Herald. 24 October 2006. Retrieved 26 June 2011. ^ AAP (25 October 2006). "US denies Vegemite clampdown". Herald Sun. Retrieved 26 June 2011. ^ AAP (25 October 2006). "US govt denies it's banned Vegemite". news.ninemsn.com.au. Archived from the original on 24 February 2011. Retrieved 26 June 2011. ^ "Vegemite Ban". Snopes (via snopes.com). 28 October 2006. Archived from the original on 16 December 2008. Retrieved 22 December 2006. ^ "US denies Vegemite ban". AAP (via News.com.au). 25 October 2006. Archived from the original on 1 March 2009. Retrieved 25 October 2006. ^ Reid Sexton (14 October 2007). "Mite not right – in prison". The Age. Melbourne, VIC. Retrieved 9 August 2015. ^ "Vegemite, Ribena being used to brew alcohol in dry communities in Queensland's Gulf region". ABC News. 12 November 2013. ^ "'Vegemite watch' rejected by PM after reports spread used to brew alcohol in dry communities". ABC News. 9 August 2015. ^ Pop, Classic (1 August 2009). "Down Under-covered". BBC News. ^ a b "True Blue". John Williamson. Archived from the original on 6 April 2004. Retrieved 9 August 2013. ^ "True Blue, 21st Anniversary". John Williamson. Archived from the original on 5 September 2012. Retrieved 9 August 2013. ^ "John Williamson". Gallipoli Cruise 2015. 10 August 2013. Archived from the original on 25 April 2013. ^ "Vegemite (The Black Death)". ^ "Obama not a Vegemite-terian". CNN. 8 March 2011. Retrieved 13 November 2011. ^ Blair, Tim (21 June 2012). "Speedy vegemite fan Ambrose". news.com.au. Retrieved 19 April 2018. ^ "Ask Steve – The Vegemite Challenge". Steve Harvey/YouTube. 10 April 2013. ^ "Hugh Jackman Shows Jimmy How to Really Eat Vegemite". The Tonight Show Starring Jimmy Fallon/YouTube. 19 May 2015. Wikimedia Commons has media related to Vegemite.